I headed down south to New Orleans the other day…well actually not all the way to New Orleans but I did head south to Oddfellow’s Rest which is Hoboken’s Cajun bar/restaurant. I have been to Oddfellows numerous times before but mainly for dinner. They used to have an amazing Cajun black pepper shrimp and fettuccine dish that I would kill for, but don’t bother looking for it because they took it off the menu. Admittedly, since that happened I haven’t been back as often. We headed to Oddfellows to celebrate a friends birthday. Most of the times that I have been at Oddfellows had been during the winter, but being a gorgeous Friday we were able to head to their back patio, which might be one of the best outdoor spots in Hoboken. Tucked between the neighboring buildings that provide a nice shade on those hot days and with plenty of plastic chairs and tables, this is an ideal place for any summer, spring, or fall happy hour. We ended up with a very large group but the waitresses and hostess were very accommodating with letting us make a Last Supper-like long table, with another table for 8 just off to the side. I started with a couple of beers because happy hour went until 8pm, but once happy hour was over I switched over to Oddfellows’ specialty drink…the hurricane. 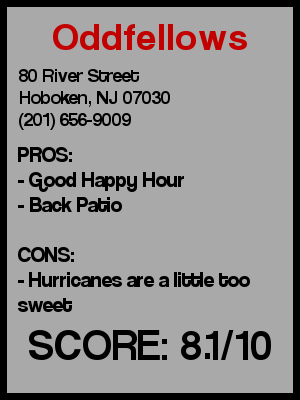 The hurricanes are $5 all day on Fridays and pack a good alcoholic punch- a little sweeter than I expected, but still tasty. I believe they limit you to 2 hurricanes per person, and I didn’t want to press my luck so after a couple of hurricanes I went back to beer. I sort of regretted that move though because it’s always tough to go back to beer after such a sweet and tasty drink. A bunch of other people were having martinis and cosmopolitans (I guess that happens when it’s a girl’s birthday) and even one Black Velvet. Date – Pretty good place. Dinner on their back patio would be great. Hookup – During their Mardi Gras celebration or maybe late on a Friday or Saturday, but otherwise no. 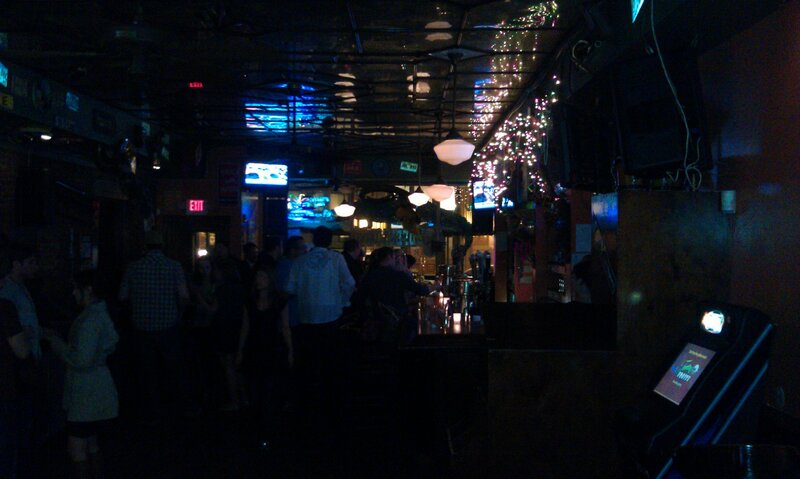 First or last drink of the night – This place is pretty good at any point of the night. Overall - One of the rare Path bars that still feels like a neighborhood place, it’s a must visit during the summer when you can really enjoy the back patio. 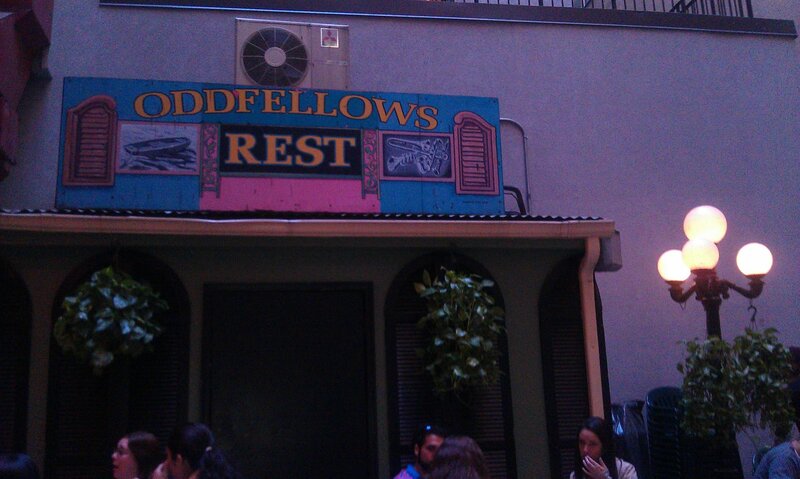 Oddfellows Rest rarely is uncomfortably packed which makes it a great place to go to anytime in the night. I love the NOLA theme which helps separate it from the countless number of sports bars in the town. On a scale of 1-10, I’ll go with a 8.1.